The Gracie family is known for their achievements in Mixed Martial Arts and established Gracie Jiu Jitsu in Brazil in 1925. They attribute their outstanding success to following a strict nutritional regime that is the result of 65 years of research and experimentation by the late Grand Master, Carlos Gracie. The Gracie Diet is based on eating natural foods and combining them in ways that allow for their most efficient digestion. The diet was designed to promote optimal health by preventing unhealthy chemical reactions in the digestive process such as fermentation and acidity. In order to change your diet you first establish a “base point” to help you understand more about your eating behaviors, which is achieved by answering a series of questions. Your responses will give you more insight into what, when and how you eat to assist you to identify the positive steps you can take to improve your diet. Small changes are the easiest to make so you will be given ample time to adjust gradually as you learn to incorporate the principles of the Gracie Diet into your daily routines. You spend one week on each phase before moving onto the next so that you can transition smoothly into the diet. Involves spacing your meals at least 4 ½ hours apart and eat just three meals each day. This is important because chemical reactions resulting from the continuous consumption of food before digestion is complete increases fermentation and blood acidity. On the Gracie Diet you must give up snacking and limit yourself to water in between meals. Involves eliminating desserts and sodas. Later you will be allowed to eat desserts but the challenge during this phase is to learn how and when to eat them. If you are still hungry after meals you should not eat dessert but rather eat more of your cooked meal instead. If you wish to eat fruit you can have it as one of the three meals of the day but not as a dessert or snack. In this phase you learn not to mix different varieties of starches in the same meal. For example, if the meal contains bread then you can eat another wheat-based food, such as pasta, but no other starches like rice or potatoes. Once you have been through the three phases you then learn the finer details of the diet, which involves very specific food combinations. Fruit, vegetables, cottage cheese, cream cheese, Monterey Jack cheese, milk, fish, avocados, beans, soy, cashews, macadamia, pistachios, walnuts, Brazil nuts, chicken and turkey breast, egg yolk, coconut water, brewer’s yeast, oatmeal, rye bread, quinoa, brown rice, whole wheat pasta, honey. You should find an activity that you enjoy and is moderately challenging with twenty to thirty minutes of brisk walking recommended as a good starting point. The Gracie Diet retails at $24.95. Encourages a lifestyle approach to healthy eating. Increases awareness about food choices. Provides advice on how to follow the diet in restaurants. The Gracie includes a 14-day meal plan with recipes. Will take some time to learn the food combinations and adjust to this new style of eating. Some dieters may get hungry between meals because snacking is not allowed. No medical or scientific proof of food combining. 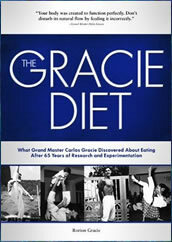 The Gracie Diet is based on eating whole foods in specific combinations so as to promote optimal digestion. While there is anecdotal evidence for the success of this eating plan to support good health and improve physical performance, the concept of food combining is not currently accepted by a large proportion of nutrition experts and researchers.